Marilyn Sotto Erdmann. My "Auntie Mare"
A Disney Career and far more. This October 27 will make it 4 years since we lost my Aunt Marilyn to Cancer. 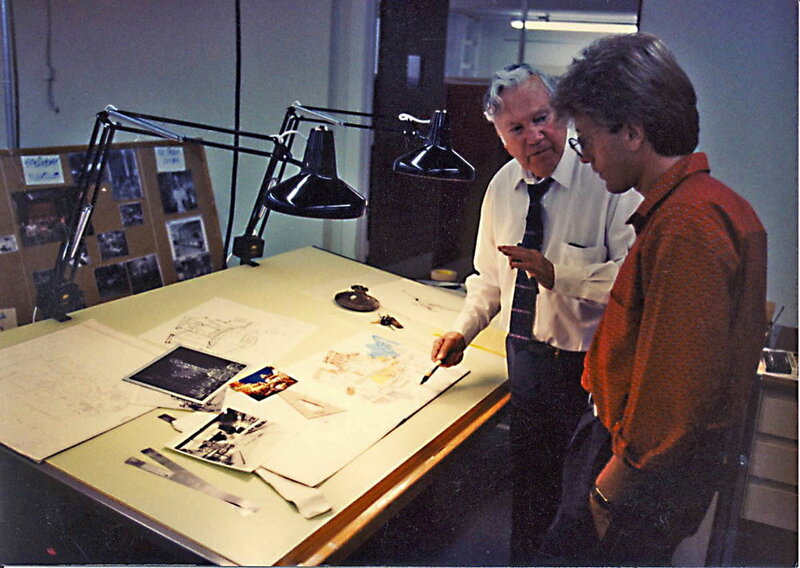 So much gets written about me, but few of you know of another Sotto who was a Disney designer (and more! ), Marilyn Sotto Erdmann had a longer Disney tenure than I, and an amazing career before that in and out of the studios, illustrating and designing costumes for some of the most memorable films of all time. We all miss her and she believed that we will one day be reunited as described here. Her “Ten Commandments” work (Pharaoh) is now in the collection of Imagineer and fan of hers, Tony Baxter. Here’s what I emailed to those who knew her at the time.. Leonard Maltin ran it on his site as well. "It’s with great sadness that I pass on that yesterday, October 27, at 4:12 pm, my Aunt, ex Disney Costume Designer Marilyn Sotto-Erdmann lost her fight with Cancer at age 82. As you may know, Marilyn brought us skills she honed after several decades in the film industry working as an illustrator for costume designers Edith Head, Jean Louis, Norma Koch and others. Her credits are numerous. Classics like Cecil B De Mille’s The Ten Commandments, To Catch a Thief, Rear Window, A Place in the Sun, White Christmas, Sabrina, and Hud, to name a few. She received screen credit for her design on Man of a Thousand Faces, something actor James Cagney demanded on behalf of Marilyn and she got it. As a kid, I’d stop and watch her work on Julie Andrews “flapper" getup for Thoroughly Modern Millie Diana Ross’ gown for Lady Sings the Blues, and many others. What an inspiration. Her talents were many; she transitioned to uniform design to bring her Hollywood touch to the opening look of the Beverly and Havana Hilton Hotels in the 1950’s. She went on to write and illustrate her own book on the subject, The Art of Costume Design. The daughter of a portrait and MGM scenic artist, she kept busy in the field of art till one day in 1986, while working on Euro Disneyland, I suggested that Marilyn consider bringing her cinematic sensibility to the costuming being designed for the Paris park, “Auntie Mare” was up for the challenge, showed her stuff, and was hired immediately. Opening Day, Disneyland Paris. Marilyn created many of the costume designs, including Casey’s. Many of you knew her and her "bigger than life" passion for design and flamboyant personality. She brought the company and her peers a great passion for what could be, always “pushing the buttonhole” to make the costumes less “uniform"-like and more theatrical to drive the story. It was always about the show. Her work did not stop after Disneyland Paris. She went on to relocate with her husband John to Florida to design Walt Disney World parade costumes, resort and cruise ship attire, Super Bowl spectacles and more. A high point to her was researching ancient animatronic costuming for Spaceship Earth’s recent facelift. She told me that she felt she had come full circle, reminding her of doing the Egyptian garb for The Ten Commandments, decades earlier. With her work from Walt Disney World Entertainment and costuming. Always working, Mare rose to Senior Costume Designer at Walt Disney World, where she could inspire young artists. They can speak to that. One thing that amazed me was how she embraced technology and never allowed her mind to tell her she was too old for something. When she saw that I had given up paper to "draw" on a Cintiq digital screen, she had to have one and demanded she be the first in her department to draw on one. How many people in their 70’s would embrace digital in order to be on the cutting edge? Only a true “Imagineer." Auntie Mare. Eventually she mastered it, others followed suit, and she shared her tips. 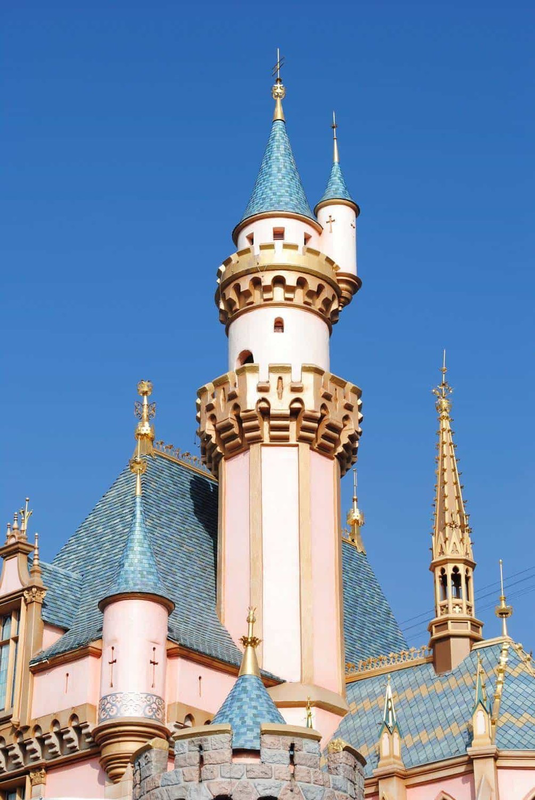 She retired from a stellar career at the Walt Disney Company after nearly two decades. Even in retirement, Mare never stopped designing and at 82 she was setting the tone for the hosts and hostesses of Embraer Executive Jets. I only hope I can stay that active! She is survived by her husband John, daughter Cynthia, brother Ed and wife Adrianne, myself, wife Deena and Mare’s grandniece and nephews, Brian and Venice." A "hole" world of detail at Disneyland Paris. Art underfoot. Guests find antique manhole covers from American cities. Art in the Park. Stories told in layers. Melnick's book has beautiful examples. Main Street USA for Disneyland Paris was designed to satisfy a European audience that was accustomed to living within "layers of history." Buildings in Europe have lived and still carry on many "lives," evolving to meet ever changing needs, yet sporting their 19th Century roots. Everywhere you look in your stroll down the streets of Paris, those layers of history stand out and remind you of another time just beneath the modern signage. People flock to the "city of lights" to experience those layers that were once called "La belle époque." Far from the mid-century suburban world of Anaheim, California, (the site of the original Disneyland,) our 19th Century "Main Street USA" needed to reward it's guests similarly with layer upon layer of it's own changes, gas lighting becoming electric, horses yielding to cars, etc. or it would feel hollow and insincere to this historically sophisticated audience. Designing for the audience. Details in Context. What would guests think if they saw our street of modern asphalt (as it was in Anaheim) when Paris still has it's cobblestones? Not a very credible representation of "turn of the century." What story could the street itself tell while waiting for an hour on the curb for the parade? In addition to making the street from brick pavers, we decided to go a step further with a tribute to those boulevards of the past. I had run across a book (Manhole Covers) that brought attention to the fact that even back in the 19th Century, manhole covers were a symbol of civic pride and stunning craft, so I asked our team create a small art installation of various antique american manhole covers for guests to discover right in the street. If the guest saw how we went to that length to embed detail, they'd assume everything had that level of thought. Seen Below. In addition to the star-studded Baltimore Fire Dept. 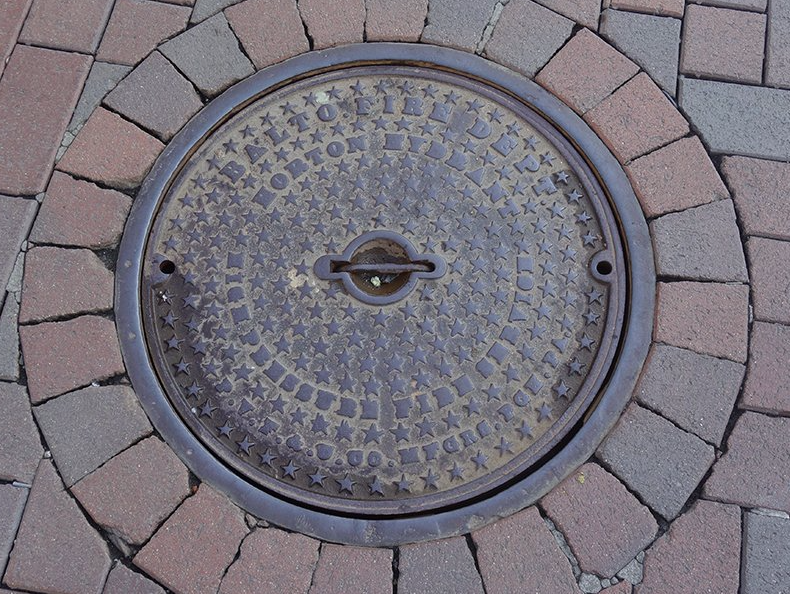 example, we installed covers from Chicago, New York's Croton Water (sporting a DWP intertwined logo), and the elaborate filagree adorning the Central City, Colorado cover. 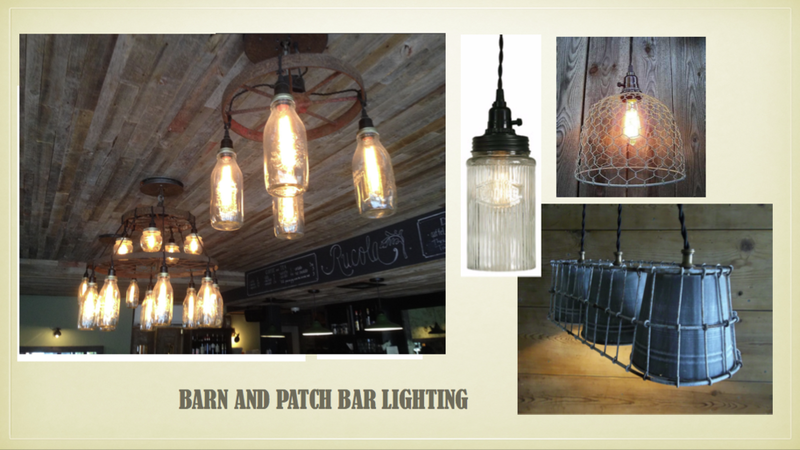 It was so pretty, we reproduced that one and used it in two locations! All of these spanned the late nineteenth century and are great examples of how cast iron was used in simple and decorative ways all at once. Story is where you find it. Thanks to David Goebel for his images and research. Wayback machine 1986. Finding Nemo in Baltimore. While working for Landmark Entertainment Group we got to design and build this great victorian Submarine in the manner of designer Harper Goff's "Nautilus," made famous in Disney's "20,000 Leagues under the Sea" epic. It was made for the "Six Flags Power Plant" family entertainment center in Baltimore, Maryland. The theme was that a professor named Phineas Flagg created many technical wonders prior to Jules Verne, Edison and others and guests could visit his world. The amazing model seen below was built by Terri Cardinali, a very talented sculptor from just one drawing! Also seen are a few shots of the finished sub. This was built on a shoestring budget and I was shocked it did not get cut from the project. Designer Joe DeMeis did the color styling. So fun and from such a small staff. Ed Sotto's original design drawing. Terri Cardinali worked at hundreds of insanely tiny details! We had to "frost" the windows because we had to choose between having the Sub, or no interior.! Still an amazing piece. 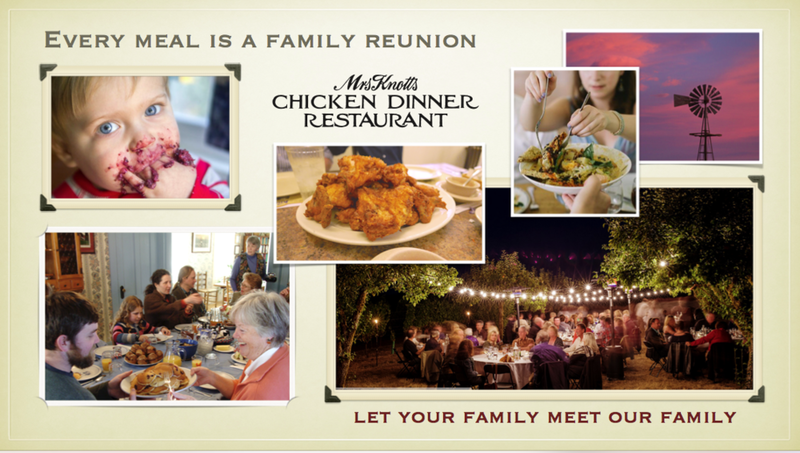 Knott's "Chicken Dinner Restaurant" Reimagined. We proposed a more inviting entrance with an active outdoor porch of rocking chairs for guests to feel "at home." Back on the farm after 30 years. Eddie Sotto began his design career at Knott's Berry Farm in 1979 as an assistant project designer. His first ride design and production was the successful "Soap Box Racer" and created some of the thematic structures and iconic character Clock for "Camp Snoopy." 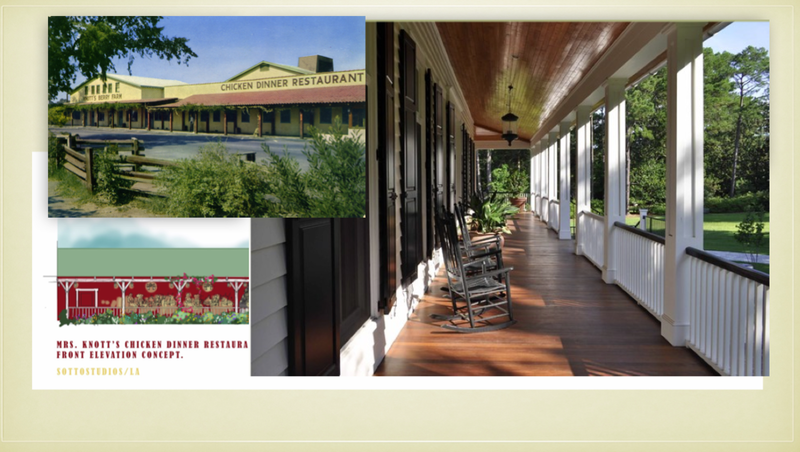 It was a great thrill to return decades later to produce a conceptual presentation and analysis for a remodel of the historic "Knott's Chicken Dinner Restaurant." Recommendations, sketches and images samples, graphic designs, plans and market trends, even historical providence went into a slide presentation. Everything matters. 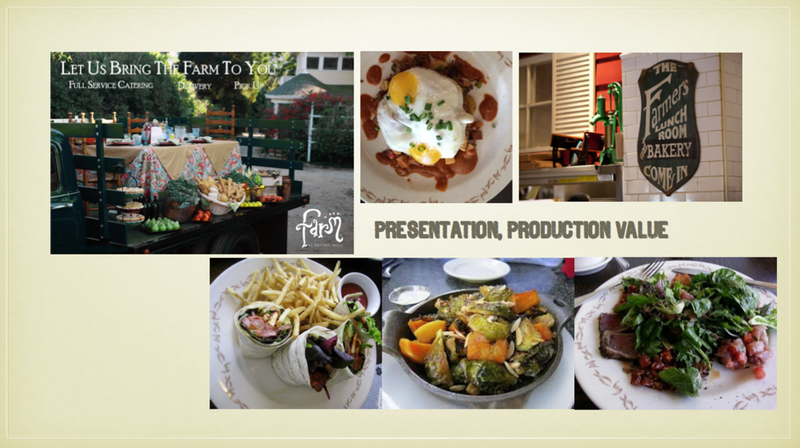 Here are just a few random slides to give you a sense of the extent to which we delved into the project. We tend to be ambitious and throw the net wide to capture the vision and then rein in some of the inspiration with the client based on what they can execute in the time and budget they have. The reason we do this is that the best ideas need to get on the table and usually they can be executed in a more modest way and still retain their power. At times, the client goes with the full vision. If you never see "the wow," how can you achieve it? 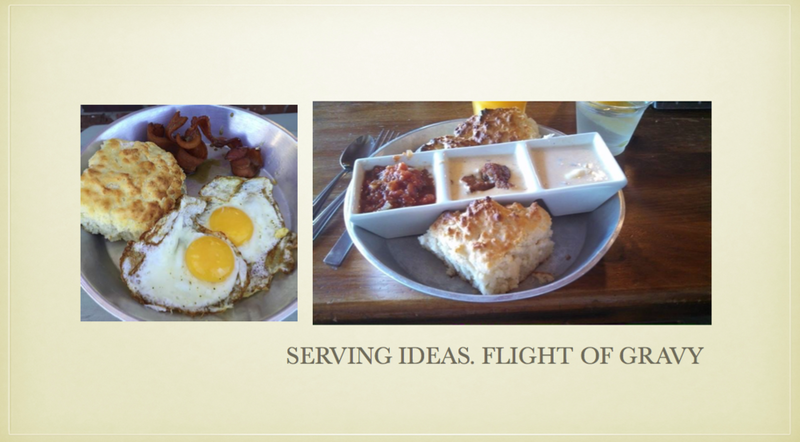 Many of those suggestions were adopted by the in-house team that executed the final remodel. Happy to have had a part in the inspiration. Telling the historic story one room at a time. Truth be told, Knott's Chicken Dinner Restaurant began as roadside berry stand that grew into a dining phenomenon during the great depression. Served on her wedding china to make bit more money, Cordelia Knott prepared her famous fried chicken in their humble home, which still stands today inside the restaurant. We wanted to bring guests into that story and let them experience the sense of family in a recreation of the Knott home. SottoStudios would love to do the same for your brand or your story. Everything matters! A "bird's-eye" view of the Restaurant. Several dining environments suited to today's tastes. The kitchen, parlor and living room of the "Knott's Farmhouse", "The Patch" Bar and Campfire, and the eclectic "Cordy's Barn" dining hall. Simply Knott's and the DNA of the brand. We often get asked what parts of project we can do and where we stop and others begin. 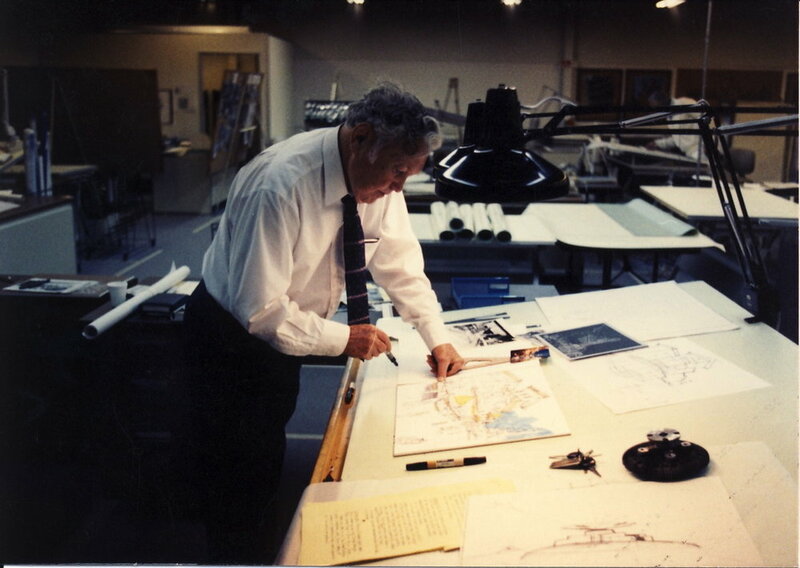 In the case of my working on Disneyland Paris, I had to serve as both creative producer overseeing and approving virtually all of the design, but also as a designer, generating the "macro" or "the big picture," with conceptual sketches (especially after Herb Ryman was no longer available.) and the "micro," the details. On a job like Main Street USA where architecture plays such a large role in telling our "story", we begin by building on loose directional sketches that are shared with the architect, and then over a series of elevations passed back and forth with the architecture team, finally refining or driving the details and other design intent in the "micro" sense. The train was to "pierce" the central marquee as to be seen moving through a section of the new station. Stained glass and wrought iron were a component of the welcoming marquee over the central entry portal. Detail had to be envisioned that would pull all of this together. Closeup details were also provided...Sotto was obsessed by each detail. Eddie's final elevation with detail produced once the architects have laid out the basic structure. 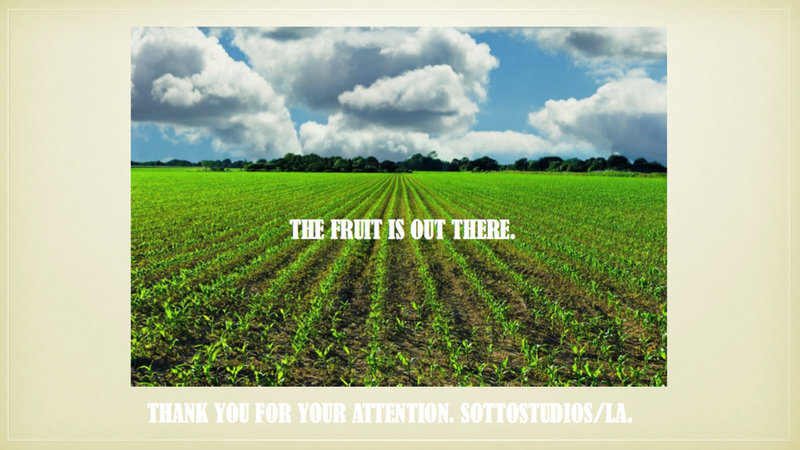 Welcome to the SottoStudios Archive. So to start things off, I often get asked if I had an interesting Disney project that never got built. "Lafitte's Island (and Catacombs)- 1998 Disneyland"
Guests find a small cemetery across from the Haunted Mansion along the river. Standing tall above the headstones is New Orleans most notorious pirate citizen Jean Lafitte. Upon closer inspection, thieves have dug up his brother's grave and opened his crypt. Dare we venture inside? Once inside the crypt, guests discover that grave robbers opened the wall revealing a spiral stair leading to adventure. In the late 1990s, long before Johnny Depp wore mascara and brandished a sword, I was on vacation in Hawaii, sketchbook in hand when the notion of transforming Tom Sawyer Island at Disneyland into "Lafitte's Island" (in honor of New Orleans most famous privateer) hit me. Disneyland had references to Lafitte in the form of naming the landing after him on the Pirates Attraction, and even an Anchor in his honor along the river. The fact behind the fiction. Historically speaking, Lafitte had a real thieves market of stolen goods on an island (Barrataria) across from New Orleans and the wealthy would shop there, so the logic made sense to me. I quickly read his alleged memoirs where he claims to have faked his death. The "driver" of this while thing was that park's operators wanted to eliminate the Tom Sawyer Rafts that transported guests back and forth, even explore closing the island for economic reasons. The Lafitte suggestion set out to address this issue by improving it's daily visitation and profitability while lowering operating costs (limited by the capacity of the rafts.) By tunneling under the river and creating a 2 way "underpass" of sorts, we would bring an unlimited flow of guests on and off with little operational cost. How? In the form of "Lafitte's secret crypt and Catacombs." 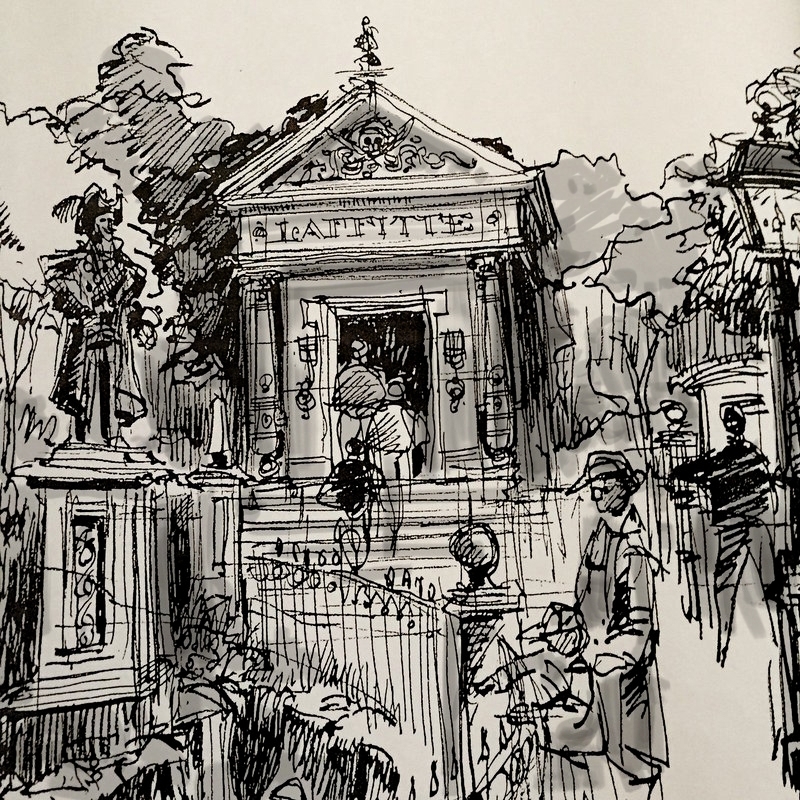 Story was that Lafitte faked his death and created a burial Crypt in a small graveyard along the river in front of the Haunted Mansion. 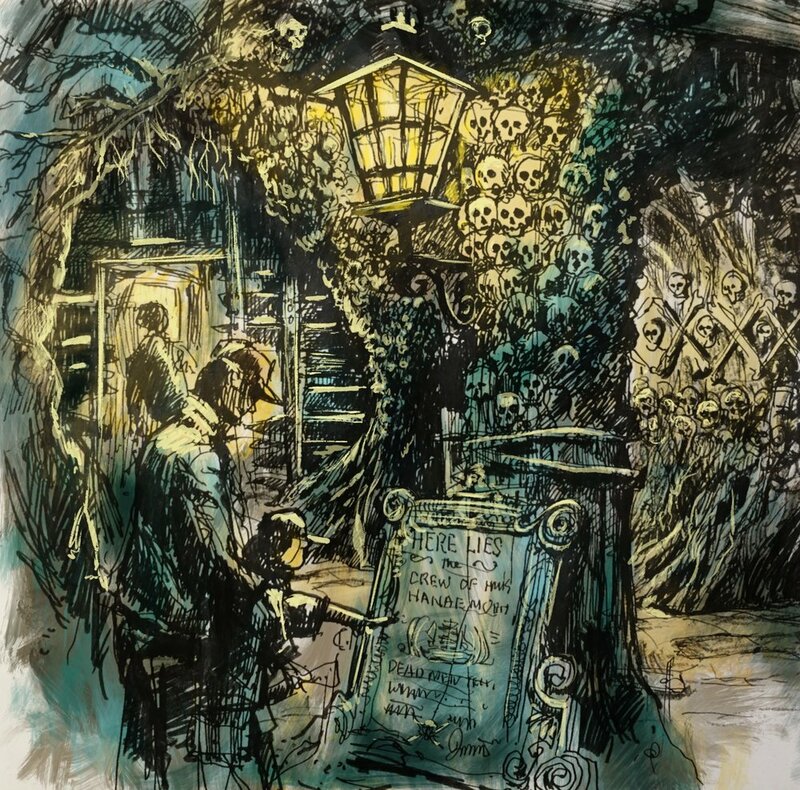 Grave robbers, knowing it was actually a secret passage had broken through to the series of catacomb like chambers, littered with treasure and the remains of Lafitte's conquests. This led to the island where a capsized series of scuttled ships hulls were covered in Earth as secret interior rooms and hideouts were there to be explored. Even though there are only a few sketches and some of them are pretty rough, others have been cleaned up in living color, so let's go!!! Guests explore the remains of lost crews, treasure and Lafitte's piratical career, chamber by nefarious chamber. At the end of the catacomb, we find a shipwreck buried below ground with stairs leading to the light of day and Lafitte's Island. Violations of ship's articles and embezzlement were taken seriously. Lafitte held court from a Spanish throne in this cavern where we hear the splash of the surf and witness the plank of the convicted. Capsizing the remains of a shipwreck and disguising it with earth, the Lafitte's were free to trade from a grand cache of treasure with the New Orleans elite. Food, Pirate grog made from gunpowder, baubles and trinkets, along with challenges in gunnery await adventure seekers. Here we see how the underground fort used to protect itself with demonstrations of captured Spanish cannons.